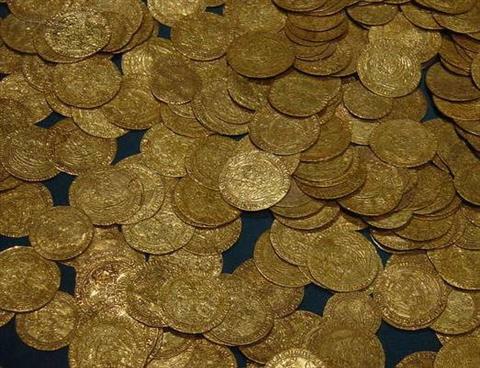 Hoard of gold coins, found buried in a field. The Kingdom of Heaven, another way of describing the Kingdom of God, describes the sovereignty of God and, by extension, the sphere of influence within which his authority is willingly acknowledged. The Kingdom is a key concept for those seeking to understand the ministry of Jesus for he repeatedly returned to that subject. Moreover, later theologian’s understanding of the Kingdom has been influential in steering the development of the Church. Judaism, with its aversion to over-familiar use of the name of God, would use Heaven as a circumlocution. Hence, as Bruce (1943, 254) notes, ‘the “Kingdom of heaven” and the “Kingdom of God” are not two different kingdoms, but two different ways of translating the Aramaic phrase that Jesus used to denote the one Kingdom.’ Indeed, in some parallel gospel passages the two are used interchangeably (compare Matt 13:31 & Mark 4:30 in ESV). Within Judaism, the phrase was well accepted shorthand for the domain in which God’s rule and reign was acknowledged (France 1995, 45-46, Duling 1996, 50) . The idea of a Kingdom of Heaven is rooted in the ancient idea of the king as the highest mortal tier of legislative and judicial authority. As the immortal transcends the mortal, so the realm of the divine transcended that of men, introducing further tiers of authority within the heavenly realms. The Biblical world-view therefore sees the creator God as not only a king, but the king of kings. The Psalms in particular contain several explicit references to God as King. For example, the palmist calls him God and King (Ps 5:2, 44:4) , he is the king forever (Ps 10:16) reigning over creation (Ps 29:10, 47:2) and superior to all other authorities (Ps 95:3, 148:11-13) . Moreover, he is especially Israel’s king (Ps 149:2) . In Jesus’ parables the role of God is represented by a king sitting in judgement (Matt 18:23, 25:34) and by a monarch throwing a feast to celebrate a marriage (Matt 22:2). The Kingdom of God takes on the attributes of God’s sovereignty, thus it is without beginning or end (Ps 145:13) and exercises supreme authority over all other Kingdoms (1 Chr 29:11, Ps 22:28, cf. Ps 103:19) . The eternal nature of the Kingdom continues to be stressed in later Jewish writings. For example, in the Testament of Joseph, where God’s eternal Kingdom is contrasted with the transitory nature of Joseph’s influence, the latter being likened to a watchman’s hammock (T. Jos. 19:12) . As God is King over both natural and supernatural realms his kingdom is naturally understood to extend to both realms. We find this envisaged, for example, in the fanciful cosmology of the second century C.E. Apocalypse of Baruch, wherein the angel Michael holds the keys to the Kingdom of Heaven that are needed in order to open a locked door into a fifth heaven (3 Bar. 11:2). The bounds of the Kingdom were defined as much by obedience to God’s commands as by any nationalistic or geographical constraints. For example, within the Babylonian Talmud, Rabbi Joshua ben Korhah claims that after one takes the yoke of the Kingdom of Heaven one should take the yoke of the commandments (Ber. 13a: 2.18) . Whilst the term Kingdom of Heaven is not found in the Hebrew Bible, the concept of Israel as a Kingdom belonging to God stretches back to the Exodus. For God declares that, subject to continued covenant observance, Israel would be a kingdom of priests to serve him (Ex 19:5-6) . In Moses’ blessing over Israel we find that he considered the Lord King over Jacob (Deut 33:5, cf. Isa 44:2) . The role of God as King over Israel is confirmed by a later word to Samuel (1 Sam 8:7) . At that time the nation had rejected an invisible king in favour of settling that title upon one of their own people. However, the throne of God remained eternal, so Israel’s human king stood accountable to God and charged as mediator of the divine sovereignty (c.f Ps 45:6-7) . As such, God appointed the king (Ps 2:4-6) and the king then occupied much the same role as Moses (cf. Ex 20:19, Gal 3:19) . The kingdom over which he exercised God’s authority was therefore, in a very real sense, the kingdom of God. King David explicitely acknowledged that his wealth and honour came from God, who remained head and to which the kingdom belonged (1 Chr 29:11-12) . Hence, Solomon was chosen to sit on the throne over the Kingdom of the Lord (1 Chr 28:5) and resisting the will of the Davidic kings was seen as resisting the Kingdom of the Lord (2 Chr 13:8) . Furthermore, the eternal nature of God’s kingdom is ascribed to David’s dynasty and its claim to ultimate authority is delegated to the occupants of his throne (cf. Ps 72:8-11, 1 Kgs 2:45, Isa 9:7) , with the important caveat that they remain faithful. Hence, through the Davidic throne in Zion (cf. 2 Sam 5:7, Ps 9:11) , the Kingdom of Heaven became a tangible entity, manifest, in measure commensurate with their piety, by whichever monarch God gave authority over it. Thus, for most practical human purposes, the Kingdom would have equated to the sphere of influence of whatever king their Lord installed in the city of David, in other words upon Mount Zion (cf. Ps 2:6, Obad 21) . In Dan 2:36-44, Daniel interprets a predictive dream experience by Nebuchadnezzar. God, he says, has made Nebuchadnezzar the head of gold, king of kings and ruler over all things (Dan 2:37-38) . Yet, after him, will come four empires that are progressively less perfect and which may be identified historically as Babylonia, Nedo-Persia, Greece and Rome (see footnote on Dan 2:32-43 in NIV Study Bible) . Then the God of Heaven will then intervene and establishes an eternal kingdom to replace these failing empires (Dan 2:44) . Later in that same book we get a glimpse of the ruler of that eternal kingdom and the authority they carried. “13 I saw in the night visions, and behold, there came with the clouds of the sky one like a son of man, and he came even to the ancient of days, and they brought him near before him. 14 There was given him dominion, and glory, and a kingdom, that all the peoples, nations, and languages should serve him: his dominion is an everlasting dominion, which shall not pass away, and his kingdom that which shall not be destroyed. 15 As for me, Daniel, my spirit was grieved in the midst of my body, and the visions of my head troubled me. 16 I came near to one of those who stood by, and asked him the truth concerning all this. So he told me, and made me know the interpretation of the things. 17 These great animals, which are four, are four kings, who shall arise out of the earth. 18 But the saints of the Most High shall receive the kingdom, and possess the kingdom forever, even forever and ever.” . . .
As the dream in Daniel suggests, during periods of exile, there was a sense that the Judaism was without the Kingdom of God and this went hand-in-hand with an expectation that the Kingdom would, in time, be restored in full measure. For example, amongst the Rabbinic writings we find this expressed in the idea that, before Abraham, God was King in heaven alone, but Abraham made him King on earth as well (Sipre Deut. 113). The full establishment of the Kingdom is therefore a natural expectation of any end-time perfected society and, as such, became the focus of Messianic expectations. At the outset of his ministry, Jesus echoed the call of John the Baptist, saying “The time is fulfilled, and the Kingdom of God is at hand! Repent, and believe in the Good News” (Mark 1:15 WEB) , a message that he in turn encouraged his disciples to take up (Matt 10:7) . Teaching on the Kingdom features prominently in the Sermon on the Mount. The beatitudes, pronounce both the poor in spirit (Matt 5:3) and the persecuted (Matt 5:4) blessed , “for theirs is the Kingdom of Heaven” (Matt 5:3,10 WEB) . Matthew 5:19-20 indicates that entry into the Kingdom was a matter of righteousness (Matt 5:20) and that there are people of differing status within the Kingdom (Matt 5:19) . What differentiates them is their attitude toward the law, those promoting obedience to it, through their model and their teaching, are promised the greater place. The Lord’s prayer sets “your Kingdom come” in parallel with “your will be done” (Matt 6:10 WEB), for the kingdom comes as God’s commands are obeyed. In Jesus’ teaching upon anxiety (Matt 6:31-34) , establishing the Kingdom was to take precedence over seeking personal security, for only with its coming would such security be assured (Matt 6:33) . Finally, in Matt 7:21-23, Jesus warns that, in order to be part of the kingdom, it is not good enough to give lip service to his lordship, it will mean doing what God wants (Matt 7:21) . Jesus used several parables that illustrate the status of the Kingdom of Heaven at the time of his ministry. It is like a delayed bridegroom whose untimely late appearance will reveal which of his waiting virgins have kept their lamps alight (Matt 25:1) , or like a master whose return after a protracted absence reveals the faithfulness of his servant’s stewardship (Matt 25:14) . It is gaining ground insidiously, like a small seed growing into a mighty tree (Matt 13:31-32) , or yeast expanding in flour (Matt 13:33) . Like a net full of fish (Matt 13:47) , or a wheat field sown with tares (Matt 13:24) it contains both good and bad, but when the judgment comes these are separated (Matt 13:50, 30) . Since the foundation of the world the kingdom has existed for the benefit of those faithful to the Son of Man (Matt 25:34) . Like treasure in a field (Matt 13:44) it may have been hidden, but, once found, it is worth giving everything to obtain. Like a pearl of great price, it remains incomparably valuable (Matt 4:45-46) . The man who discovers treasure is usually taken to be the disciple discovering the wisdom of God. However, a different perspective is possible, for, although all the earth is God’s, his kingdom is a peculiar treasure (cf. Exod 19:5) and he will give nations for its ransom (Isa 43:3-4) . In the case of the Noahic flood, all else was given up in order to establish the kingdom anew. In debate with the elders and chief priests (Matt 21:23) , Jesus explained how John the Baptist came in the proper manner to establish the way of righteousness (Matt 21:32) , and that therefore those who believe John go into the Kingdom ahead of those who refuse to. The previous high status of the elders and priests is immaterial, it is now a matter of belief. Jesus describes the act of entry into the kingdom in the present tense (as well conveyed in Matt 21:31 NIV). Thus, those obedient to John’s teaching, and subsequently those obedient to Jesus, were busy occupying the kingdom. Jesus then likened the kingdom to a vineyard, leased to tenants on condition that the owner (i.e. God) receive his portion of the harvest (i.e. the fruit of repentance) (Matt 21:33-41) . When the current tenants prove rebellious, to the point of murdering the owner’s son, they are destroyed and the lease handed over to tenants who will be more faithful. Jesus’ concluding comment on the parable of the tenants (Matt 21:43) clarifies that prior to this the kingdom had been leased to the chief priests and the elders, but now a new people will occupy it, by implication, those obedient to him. Jesus’ parables illustrate how, in his day, the rewards of the Kingdom were offered to people who did not deserve them. Those who entered the kingdom were like random passers-by treated to a banquet simply because they could be bothered to get properly dressed and come (Matt 22:2-13) , or the last-hired vineyard labourers receiving the same wage as those hired at the outset of the day, simply because they showed up and served (Matt 20:1-10) . Once again, it is clear that the boundary of the kingdom is defined by obedience. In the later New Testament the Kingdom of God and the Kingdom of Christ are seen as synonyms (cf. Eph 5:5, Rev 11:5) . Colossians portrays the transfer of the believer into the Kingdom of the Son (Col 1:13) in very much the same terms as first-century Judaism portrays the transfer of a believer into the Kingdom of Heaven. In Rev 5:9-10, the text is explicit that Jesus, by his blood, has established a kingdom of precisely the sort envisaged in Exod 19:5-6, a kingdom of priests and a holy nation . The coming of the Kingdom of God once again goes hand in hand with the presence of a man worthy to exercise its divine authority (Rev 12:27) , a king of kings and Lord of lords (1 Tim 6:14-15, Rev 17:14) , and sole mediator (1 Tim 2:5) . A hoped for post-apocalyptic state (Duling 1996, 49) . For some it has even been an open-ended symbol capable of varied interpretation (Duling 1996, 49) . Bruce, Frederick Fyvie. 1934. The Kingdom of God: A Biblical Survey. Evangelical Quarterly 15:263-268. Duling, Denis C. 1996. Kingdom of God, Kingdom of Heaven. Pages 49-69 in vol. 4 of ABD. France, Richard Thomas. 1995. The Gospel According to Matthew: An Introduction and Commentary in Tyndale New Testament Commentaries. Edited by Leon Morris. Leicester: Inter-Varsity Press, 1995.